Posted on October 25, 2018 at 6:01 am. First up — Tell your parents! Arena-style, Parent – Teacher conferences are about to begin — TONIGHT from 4:30 to 7:30 p.m.; and TOMORROW from 7:30 to 11:30 a.m. No appointment is necessary, just come on in and have a chat. What could be better — your parents and teachers, alone in a room, talking about YOU. Hooray for Parent-Teacher Conferences!! In light of the tonight’s conferences, several clubs will NOT be meeting after school today. Earth Club has been RESCHEDULED for next THURSDAY during ASP 1 in room 111; and the Geo Club has also been RESCHEDULED for next THURSDAY during ASP 1 in room WW9. For more information about what after school activities are scheduled for today, either check in the main office or visit your activity sponsor. Attention 8th graders! Today, the Cavaliers team will be visiting the Arlington Career Center. These tours are NOT just for students who plan to apply to Arlington Tech. Many of you will take courses at the Career Center while in high school, and this is your chance to see everything it has to offer. Cavaliers should go to there lockers following FIRST PERIOD and put everything away, and then proceed immediately to the cafeteria. Have a good trip! Put your creative genius to the test! Today is your LAST CHANCE to enter a project in the PTA Reflections Contest — “Heroes Around Me.” So if you’ve been working on an entry — TURN IT IN!! The submission forms and submission box are located in the library. Good luck! The WMS Kindness Club’s Hurricane Relief Fundraiser is nearly complete — and WOW have we raised a LOT of money. The current results are posted outside of the cafeteria — and as of yesterday it appears that the 6th grade is RUNNING AWAY with the title for most money collected. But students and parents can still make donations tonight and tomorrow during the conference schedule, so keep ’em coming. Every penny counts for Hurricane Relief! Listen Up, Wolf Pack! Did you know that ONE-in-EIGHT women will develop invasive breast cancer over her lifetime? October is Breast Cancer Awareness Month. So next TUESDAY, October 30th, we at WMS will be wearing PINK to show our support for survivors, fighters, and families of those affected by Breast Cancer. ALL students and staff are encouraged to participate, and to wear as much PINK as you can. Once again, next TUESDAY — Let’s PINK OUT for Breast Cancer Awareness!! We’ve got a BIG announcement today from the WMS Drama Department for all you theater-lovers out there — this year’s Theatre Arts Spring Musical will be: Disney’s Alice in Wonderland, Junior!! Auditions are scheduled for December 17th and 18th, and rehearsals will begin in mid-January. And then it’s ON WITH THE SHOW — three performances on April 4th, 5th & 6th. More information will be coming soon, so stay tuned, Musical Theatre wolves!! Attention 6th graders — It’s time to GET DOWN and BOOOOOOOO-gie! Just in time for Halloween, the 6th grade Spook-tacular Skeleton Stomp is coming at you — courtesy of the WMS PTA. It’s scheduled for TUESDAY, October 30th during ASP 1 and 2 in the cafeteria — so you can still take the late bus home. There will be food, a DJ and dancing, games, raffles, prizes and more. And please — despite the Halloween theme — NO COSTUMES. And finally today — BOO! Didn’t mean to scare you — but can you BELIEVE it’s almost Halloween?! Next Wednesday is All Hallow’s Eve — and students are encouraged to dress up in your best costume for the occasion. However, there are some important guidelines that you need to follow. 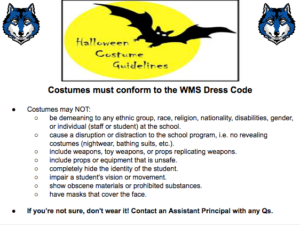 Basically, costumes must conform to the WMS dress code, not offend anyone, no weapons, no masks, nothing inappropriate. — and everything else you see on your screen. And if you’re not sure — ask a teacher or administrator. If your costume crosses the line, you’re not in trouble — but a school official may ask you get “in line.” Thanks for understanding, and have a Happy Halloween! !